In 1895, Oscar Wilde was sentenced to 2 years of hard labor for acts of ‘gross indecency’. During his time at Reading Gaol, he witnessed a rare hanging, and in the three years between his release and his untimely death in 1900, was inspired to write the following poem, a meditation on the death penalty and the importance of forgiveness, even for (and especially for) something as heinous as murdering one’s spouse; for even the murderer, Wilde argues, is human and suffers more so for being the cause of his own pain, for ‘having killed the thing he loved’; for everyone is the cause of someone else’s suffering and suffers at the hands of another. It is this that Jesus Christ could see; he could continue to see the beauty of our humanity, despite all that we may do to each other, and encouraged us to love each other just the same. 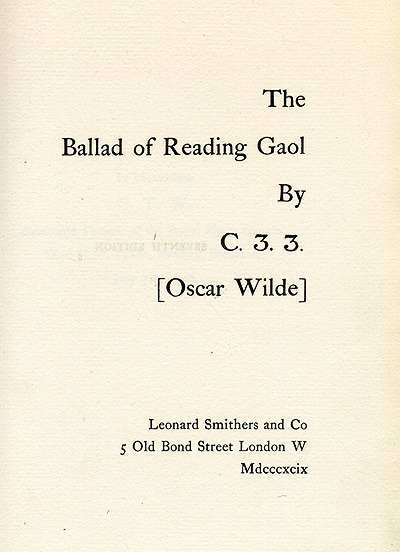 The Ballad of Reading Gaol is a poem by Oscar Wilde, written in exile either in Berneval or Dieppe, France, after his release from Reading Gaol on or about 19 May 1897. Wilde was incarcerated in HMP Reading, in Reading, Berkshire, after being convicted of homosexual offences in 1895 and sentenced to two years' hard labour in prison. During his imprisonment, on Saturday 7 July 1896, a hanging took place. Charles Thomas Wooldridge (CIR 1866 - July 7, 1896) had been a trooper in the Royal Horse Guards. He was convicted of cutting the throat of his wife, Laura Ellen, earlier that year at Clewer, near Windsor. He was only aged 30 when executed. This had a profound effect on Wilde, inspiring the line "we all are guilty of killing the thing we love." The finished poem was published by Leonard Smithers in 1898 under the name C.3.3., which stood for cell block C, landing 3, cell 3. This ensured that Wilde's name - by then notorious - did not appear on the poem's front cover. It was not commonly known, until the seventh printing in June 1899, that C.3.3. was actually Oscar Wilde.